I have been an educator for 17 years. I love teaching like breathing. I am a former luddite turned blogger and professional development nerd. My BA in English is from Earlham College, my MAT is from Brown University, and my EdD in Teacher Leadership is from Walden University. I am also a Level 1 Google Certified Educator. Yes, you do have to help everyone. I cannot tell you deeply it irks my soul when teachers give up on kids. Of course, if you asked them, they would insist that they haven’t given up. I disagree. Being willing to help a student who asks for it is not enough. It is not enough to say ‘I will help anyone who wants my help.’ If you limit your reach to those who seek you out, you have given up on all the others. We don’t get to cherry pick who we help. We have an obligation to find ways to help Every. Single. Student. Even, maybe especially, those who do not ask for it. It is difficult, but it can be done. 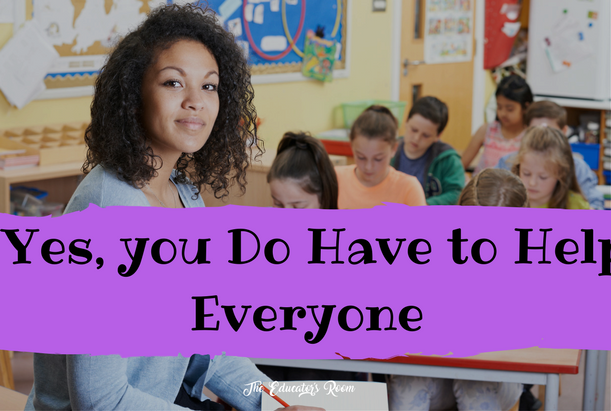 Here a few ways to match the words “I believe every kid can learn” to your actions in the classroom. Walk around-Kids are funny creatures. They want help, but they don’t want anyone to know it. Or, they want help, but they only feel loved if it is offered rather than solicited. Or, they need help, because they are doing it (whatever it might be) incorrectly, but they don’t know it. Or, they need help, and they are introverted, shy little things. Or they need help, but some trauma prevents them from seeking it. Many of those students will accept help and even ask for it when you are proximate. Give chances-The more opportunities kids have to make mistakes and then correct them, the more they learn. The more supported they feel when they take the risk of trying something difficult, the more effort they will put forth. This applies to both behavior and academics. Discipline is about self-management, not punishment. That doesn’t mean there shouldn’t be consequences. It means consequences and empathy are not mutually exclusive. Call home–It is cliche, I know, but home contact matters. It demonstrates care. Especially with adolescents, calling home demonstrates you are willing to look past all their teenager-ness and recognize they are still children. Plus, nothing says you have to call home to talk to a parent. It is amazing how incredibly effective it can be to call home to talk to your student. Expect excellence-When you have high expectations, you stop accepting mediocre work. This goes hand and hand with giving chances. If you refuse to let kids turn in crap and get away with it, they generally stop trying to get away with minimal effort. Students need to hear from you that no matter what their problems are, screwing up their education, their grade in your class, will not help. Be flexible-Follow the learning more than the lesson plan. Don’t be afraid to change course midstream. Insist on mastery of objectives, but not adherence to your vision. The more control kids have over how they learn, how they demonstrate that learning, how they use their time and their learning, the more productive they will become (it takes practice and strong routines, to be sure). Admit mistakes-The best way to show students that everyone can learn is to try things with them. Make mistakes in front of them and then demonstrate how you cope. Allow them to help you improve. The more vulnerable you can be as a learner, the more vulnerable they will be. Making and owning mistakes has to be modeled. Use open-ended questions-When kids know there is no one right answer going into a task, the quality of thinking improves and the fear of failure decreases. “Right” answers are the enemy of both creativity and curiosity. Find ways to let students explore concepts, questions, ideas and draw their own conclusions. Provide feedback-I don’t mean write comments on finished products. I mean talk to kids, conference with them, read their drafts, point out areas of improvement, model revision. Meaningful feedback is real time and actionable. A thirty second interaction during practice will likely yield better results than all the end product feedback in the world. Talk less and listen more-Give students more opportunities to talk to you and each other. Insist on hearing their ideas and explanations. Aside from the fact that many students clarify their thinking by rehearsing it orally, when they talk to each other, they learn from each other. The more you can listen to their talk as they share with the class and with each other, the more you can discern their level of understanding. I won’t say I do all these things every day. But I strive to. I do believe that these are the things that help me meet the obligation of helping every kid, whether they like it or not. I believe that these things create an environment where students believe I will help them and I believe them. Because it isn’t enough to offer help and then wait for kids to take it. We have to find a way to reach for them. We have to keep stubbornly our hand outstretched no matter how many times students try to slap it away.